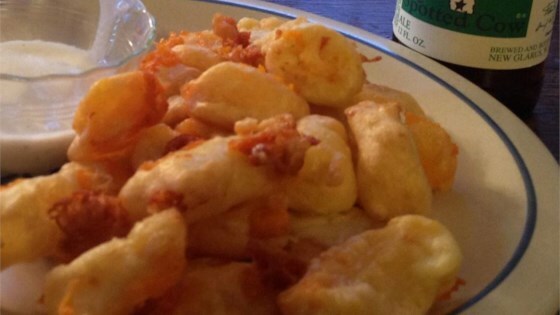 "Real Wisconsin fried cheese curds!" Heat corn oil in a deep-fryer or large saucepan to 375 degrees F (190 degrees C). Whisk together milk, flour, beer, salt, and eggs to form a smooth, rather thin batter. Place cheese curds, about 6 or 8 at a time, into the batter, stir to coat, and remove with wire strainer. Shake the curds a time or two to remove excess batter. Deep fry the curds until golden brown, 1 or 2 minutes. Drain on paper towels; serve hot. Are you kidding me??? These we SOOOOOOO good--just like at the fair. The trick is to find cheese curds--not so easy in my area. Not so healthy, but when something tastes this good, who cares?